I just had a bit of a start. I leant back from my desk, and looked at the ceiling. 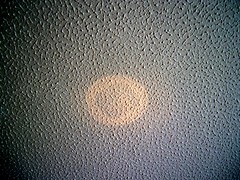 The Mysterons are after me. Help! For those not 'in the know', the Mysterons were the baddies in 'Captain Scarlet' (he with the cool drum beat, but not as cool as Stingray). Each episode started with circles of light playing over the 'cast', and the voiceover 'This is the voice of the Mysterons, we know you can hear us, Earth Men'. The 'Earth Men' was said with real venom. Fortunately, I didn't have the voiceover, just the circle of light. It was a reflection from a cable-tidy, and not the Mysterons at all.